Little Viking Horse® came into being because I use to ‘voice over’ our horses, Johnny Morris style, and in particular Fleygur’s voice always seemed to just come to me. Fleygur was a little horse with big ideas and when I looked at him I felt I could hear what he might be saying. A horse with ‘issues’ for sure, but he thought he was awesome. Roger, my husband found it highly amusing so I set up the Facebook page for a bit of fun. Before I knew it I had 70 followers, then 100, then 200…and now over 2300! 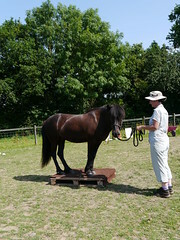 I blogged to entertain, but also to promote the Icelandic horse and so I created this website too. Fleygur (LVH) and Roger (My Mate Roger or MMR) soon became well known in the small Icelandic horse community in the UK, and LVH was appointed as a PR celebrity by the Icelandic Horse Society GB and features on the Website www.ihsgb.co.uk. Because the blog featured Roger and Fleygur people initially thought that Roger wrote the blog, but I was soon outed as the writer, even though I tried to keep myself in the background, not even using my own name. 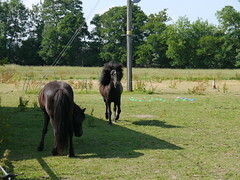 My little Icelandic mare Gydia (My Mare Gydja) and my Welsh Cob cross, Beanie (Big Fat Cob) also featured in the blog. We added to our little herd with Svipur, the Baby Blondie (who went on to have many names!) and later Good Boy Jandi, and we were having a fine old time. 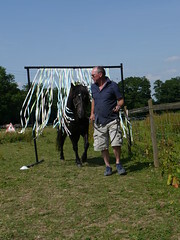 Roger encouraged me to fulfil my dream of writing and I started my first children’s book, The Little Viking Horse. Then, in May 2016 Roger died suddenly of a heart attack. I was devastated. Although the horses were part of what got me through those early days and weeks of shock for a while I could not ‘hear’ Fleygur’s voice. I did not know if this blog would continue. I posted about Rogers death on the page, and the website and was inundated with messages of love and support. As well as the devastating loss of my soulmate I lost a lot of confidence with the horses without Roger, and throughout 2016 and 2017 I battled with anxiety. I even considered giving up my beloved horses. In the end my youngester, Jandi went on loan to some good friends, but Gydja, Svipur (aka Blondie) and of course the Little Viking Horse Fleygur, remain. I continued to write, I found it cathartic, and received nothing but love and encouragement in return from Little Viking Horse followers around the world. My confidence continues to improve and periodically I write about my struggles, successes and set backs on the blog page of this website.